survival, emergency preparedness, prepper, survivalist, everyday carry, emergency kit: Can new planet be Earth 2? Can new planet be Earth 2? An Earth-size planet has been spotted orbiting a nearby star at a distance that would makes it not too hot and not too cold — comfortable enough for life to exist, researchers announced on September 29. If confirmed, the exoplanet, named Gliese 581g, would be the first Earth-like world found residing in a star's habitable zone — a region where a planet's temperature could sustain liquid water on its surface. And the planet's discoverers are optimistic about the prospects for finding life there. "Personally, given the ubiquity and propensity of life to flourish wherever it can, I would say, my own personal feeling is that the chances of life on this planet are 100 percent," said Steven Vogt, a professor of astronomy and astrophysics at the University of California, Santa Cruz, during a press briefing today. "I have almost no doubt about it." His colleague, Paul Butler of the Carnegie Institution of Washington, in Washington, D.C., wasn't willing to put a number on the odds of life, though he admitted he's optimistic. "It's both an incremental and monumental discovery," Sara Seager, an astrophysicist at the Massachusetts Institute of Technology, told SPACE.com. Incremental because the method used to find Gliese 581g already has found several planets most of the known planets, both super-Earths, more massive than our own world outside their stars' habitable zone, along with non-Earth-like planets within the habitable zone. "It really is monumental if you accept this as the first Earth-like planet ever found in the star's habitable zone," said Seager, who was not directly involved in the discovery. Vogt, Butler and their colleagues will detail the planet finding in the Astrophysical Journal. The newfound planet joins more than 400 other alien worlds known to date. Most are huge gas giants, though several are just a few times the mass of Earth. Gliese 581g is one of two new worlds the team discovered orbiting the red dwarf star Gliese 581, bumping that nearby star's family of planets to six. 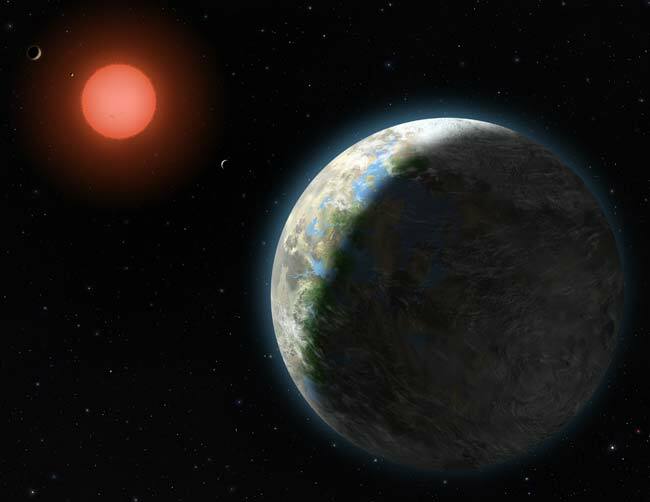 The other newfound planet, Gliese 581f, is outside the habitable zone, researchers said. The star is located 20 light-years from Earth in the constellation Libra. One light-year is about 6 trillion miles (10 trillion km). Red dwarf stars are about 50 times dimmer than our sun. Since these stars are so much cooler, their planets can orbit much closer to them and still remain in the habitable zone. Estimates suggest Gliese 581g is 0.15 astronomical units from its star, close enough to its star to be able to complete an orbit in just under 37 days. One astronomical unit is the average distance between the Earth and sun, which is approximately 93 million miles (150 million km). The Gliese 581 planet system now vaguely resembles our own, with six worlds orbiting their star in nearly circular paths. With support from the National Science Foundation and NASA, the scientists — members of the Lick-Carnegie Exoplanet Survey — collected 11 years of radial velocity data on the star. This method looks at a star's tiny movements due to the gravitational tug from orbiting bodies. The subtle tugs let researchers estimate the planet's mass and orbital period, how long it takes to circle its star. Gliese 581g has a mass three to four times Earth's, the researchers estimated. From the mass and estimated size, they said the world is probably a rocky planet with enough gravity to hold onto an atmosphere. The planet is tidally locked to its star, so that one side basks in perpetual daylight, while the other side remains in darkness. This locked configuration helps to stabilize the planet's surface climate, Vogt said. "Any emerging life forms would have a wide range of stable climates to choose from and to evolve around, depending on their longitude," Vogt said, suggesting that life forms that like it hot would just scoot toward the light side of that line while forms with polar-bear-like preferences would move toward the dark side. Between blazing heat on the star-facing side and freezing cold on the dark side, the average surface temperature may range from 24 degrees below zero to 10 degrees Fahrenheit (minus 31 to minus 12 degrees Celsius), the researchers said. Supposedly habitable worlds have been found and later discredited, so what makes this one such a breakthrough? There's still a chance that further observations will dismiss this planet, also. But over the years, the radial velocity method has become more precise, the researchers point out in their journal article. In addition, the researchers didn't make some of the unrealistic assumptions made in the past, Seager said. For instance, another planet orbiting Gliese 581 (the planet Gliese 581c) also had been considered to have temperatures suitable for life, but in making those calculations, the researchers had come up with an "unrealistic" estimate for the amount of energy the planet reflected, Seager pointed out. That type of estimate wasn't made for this discovery. "We're looking at this one as basically the tip of the iceberg, and we're expecting more to be found," Seager said. One way to make this a reality, according to study researchers, would be "to build dedicated 6- to 8-meter-class Automated Planet Finder telescopes, one in each hemisphere," they wrote. The telescopes — or "light buckets" as Seager referred to them — would be dedicated to spying on the nearby stars thought to potentially host Earth-like planets in their habitable zones. The result would be inexpensive and probably would reveal many other nearby potentially habitable planets, the researchers wrote. Beyond the roughly 100 nearest stars to Earth, there are billions upon billions of stars in the Milky Way, and with that in mind, the researchers suggest tens of billions of potentially habitable planets may exist, waiting to be found. Planets like Gliese 581g that are tidally locked and orbit the habitable zone of red dwarfs have a high probability of harboring life, the researchers suggest. Earth once supported harsh conditions, the researchers point out. And since red dwarfs are relatively "immortal" living hundreds of billions of years (many times the current age of the universe), combined with the fact that conditions stay so stable on a tidally locked planet, there's a good chance that if life were to get a toe-hold it would be able to adapt to those conditions and possibly take off, Butler said.